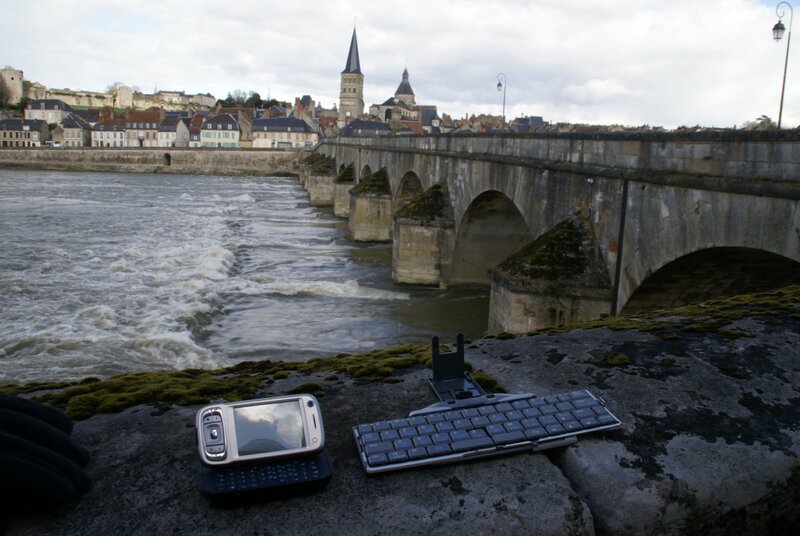 And while I have access to a decent, real computer here in Vienna, able to post serious photos taken with a serious camera, here’s a shot from back in France, on the Loire at La Charite (once a major stop on the Camino to Santiago), of my mobile office. O2 Stellar Blackberry-enabled mobile on the left (also more technically known as an HTC Kaiser), and folding Stowaway keyboard on the right. Apart from the last two, all the photos on this blog are taken by the mobile (hence my previous inability to post a picture of the actual device), and although a bit fiddly, the keyboard works very well with Bluetooth. And the other bit of kit that is now working better is the old tendon. I’m told today by sensible medics (my GP phoned in Cirencester) that it’s actually OK to keep cycling, gently, and fill up with Nurofen at the same time. So, the trip remains very much on – though several days, if not a week or two, of quiet in Hungary are about to ensue, perhaps with a focus on learning Hungarian properly at last.